Pre AVG: Attended the University of Nebraska before joining U.S. Army Air Corps in 1939, midway through his senior year. Received primary flight training at Santa Maria, CA; basic training with Class 40-C at Randolph Field, TX; and advanced training at Brooks Field, TX. Commissioned a Second Lieutenant in June 1940, and returned to Randolph Field where his first assignment was as a basic flight instructor. AVG Service: Resigned commission in July of 1941 in order to join the AVG. Saw his first combat action over Rangoon on December 23, 1941. 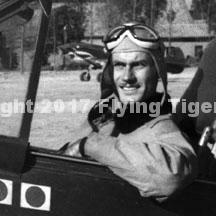 Promoted to Flight Leader in the Third Pursuit Squadron, he was credited with shooting down 8.7 Japanese planes, and was twice decorated by the Chinese government. Returned to the US and was drafted into the Army as a Private in December of 1942, but was quickly re-commissioned as a US Air Corps Second Lieutenant and promoted to Major the next month. For the next few months, as Commanding Officer of the 337 Fighter Squadron, 329th Fighter Group at Grand Central Air Terminal, Glendale, CA, and Paine Field, Everett, WA, he trained replacement pilots using P-38s. He married Barbara Bradford in June of 1943. That fall, he volunteered to return to the China-Burma-India Theater with the 1st Air Commando Group, flying occasional P-51 missions and commanding that group’s B-25 squadron. R.T. (for ‘Round Trip’ according to Chuck Baisden, while in the 1st Air Commando Group) was promoted to Lieutenant Colonel in March, 1944, flew 55 combat missions over Burma, and was awarded the Air Medal, Distinguished Flying Cross, and Silver Star. He returned to the States in the late spring of 1944 and was assigned as Director of Flight Training with the 441st Army Air Force Base Unit at Van Nuys, a P-38 training base in California. Resigned from the Air Corps at the conclusion of World War II and settled in the San Fernando Valley in Southern California. After flying for two years with Trans-World Airlines (TWA), he wrote for the Hopalong Cassidy Western Adventure Show, Lum and Abner, and the Clyde Beatty Show for several years. He also was co-owner of a toy manufacturing company (Smith-Miller) and developed and sold a product for conditioning automobile convertible tops (Top Secret). He and Barbara were divorced in 1955. About that time, he joined Lockheed Aircraft Corporation as a technical writer, working his way up through the organization, first as a military sales representative for the F-104 Starfighter, and later to open and manage a new corporate office for Lockheed in Newport News, VA. He married Ronni Burkett in July of 1965. During the late 60’s, he joined the Flying Tiger Line, first as Vice President for Industrial Affairs in Washington, D.C. and later as Vice President for the Far East headquartered in Tokyo. He left the Flying Tiger Line and Tokyo in the early 70’s to live and work in the Palm Springs area. He and Ronni were divorced in the mid-70’s. He returned to the San Fernando Valley where he continued to reside until he died at age 77 of lung cancer on August 21, 1995. During this time he wrote and published Tale of a Tiger, based on facsimiles of his original diary entries, and several articles for Air Classics magazine. He also established a mail-order business, selling his book and a variety of color photographs he had shot while he was in the AVG and 1st Air Commando Group. He was survived by his sister, June, who died in 2001; three sons, Bradford, Robert, and William (William Reed Smith, named in honor of his good friend, Bill Reed), and three grandchildren. Contributed by Brad Smith.